Growing up in an Italian household, pasta was frequently on the menu. I consider myself to be an anomaly, a non-pasta loving Italian who would rather dunk a loaf of bread into sauce than dig into a bowl of spaghetti or linguine. The Italians among us are probably thinking disgrazia! and you’d be right. For me, pasta night was always about the lure of the moist and flavorful meatballs my mom would serve and how little pasta I could get away with eating. To this day, the ratio of meatballs to pasta is still severely skewed. Some things never change. But with meatballs this good, who could blame me? Chop onion, celery and 2 cloves garlic finely in food processor before placing in a medium skillet. Drizzle a generous tablespoon of olive oil and sauté on medium heat until all the liquid has evaporated and the onions are tender and translucent. Add additional olive oil if needed to prevent onion mixture from drying out. Season lightly with salt and pepper. Press the remaining 3 cloves of garlic through a garlic press and stir until fragrant. If you do not have a garlic press, go to the store and buy one mince garlic and crush with the blade of a knife. Turn off heat and let onion mixture cool to room temperature. Chop bread ends into 1/2 inch cubes and place in small dish. Add enough milk so the liquid can be absorbed and soften the bread without being submerged. In a medium mixing bowl combine the ground beef, ground pork and onion mixture. Drain the excess milk from the bread before incorporating it in the meat mixture. Add the egg, ketchup and Worcestershire and stir. At this point the mixture should be quite wet. Incorporate the Parmesan cheese, basil, oregano, Montreal steak seasoning, and crushed red pepper into the meat mixture. Sprinkle generously with breadcrumbs before evenly incorporating. Continue to add breadcrumbs and mix until the mixture is firm, yet tender. You do not want the meatballs to be wet. Add a couple spoonfuls of flour to a bowl. Using a small cookie scoop or tablespoon, shape into meatballs lightly between the palms of your hands using a circular motion. Dip the meatball in flour before shaping again between palms to remove excess flour. Repeat this until all meatballs have been formed. In a medium skillet, heat equal part olive & canola oil so that the entire bottom of the pan is coated. 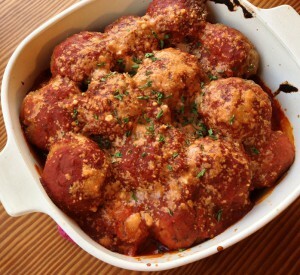 When the oil is hot add the meatballs and cook in batches until all sides have browned. Remove and drain on paper towels. 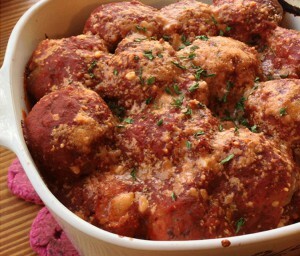 In a medium casserole dish or corning ware, layer your favorite sauce and grated Parmesan over the meatballs and bake at 350 degrees for 25 minutes or until sauce is bubbling. I try to use up any bread that will otherwise go to waste as meatball filler. For this recipe I had some extra Grands biscuits lying around that I incorporated in my milk mixture. I’ve also used Stove Top Stuffing Mix in the past. Feel free to get creative! As far as texture goes, my mom’s rule of thumb for meatballs/meatloaf is that the texture should feel like the skin between your thumb and pointer finger when you make a fist. There should be firmness with a bit of give. Fear not vegetarian friends, I have a “meatball” recipe coming for you too! This entry was posted in Recipes and tagged Meat by chrystiewithay. Bookmark the permalink.